For Sale: She rides, drives, & packs! One day you’re reading through the ads and you see her. She’s just what you’re looking for. Beautiful! Look at all that color! You decide to make a phone call. The feller on the other end says "She does every thing, come on down and take a look. I’ll take $1500.00 for her." You jump in the truck thinking, "boy I’m gonna own a mule." When you get there, the mule is all saddled up ready to go. The trader starts telling you all about the mule. He gets on and rides and then offers to let you ride. You’re excited. You ride around a little. Maybe you notice that the mule won’t go just where you want or your having to pull her around. That’s OK -she’s cheap, and a mule. So you decide to take her home. When you get home you put her in the corral because it’s late. It’s late because it took three hours to load this great mule. Now you feed your mule and say good night. The next morning you go out and walk into the corral. Old "good deal" won't come near you. Two hours later and much help from the neighbors enable you to catch "good deal." Now you are leading the mule to the hitch rail and you wish you had a tractor to lead with. With her tied at the hitch rail, you go to brush "good deal" and she tries to kick your head off …and on and on and on. Now this is just one little story out of hundreds we have heard over the years. Lots of folks have thoughts on what a broke saddle mule is supposed to look like. I like what Ben Tennison said in one of his articles. "My favorite color is broke." Which is the old cowboy term for trained or, as I have seen it on most outfits, half trained. I want to share with you some of the things you can look for in a mule that rides, drives and packs. First, let's look at a saddle mule. "Disposition" is everything for any mule. If your mule won't work with you and doesn’t like people, don’t go any further. As you are looking at the mule, let the owner go into the corral to get the mule. If the mule is all ready saddled when you get there, this always throws up a red flag to me. 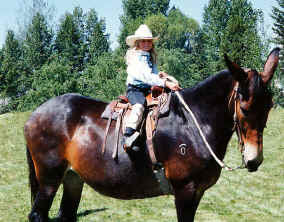 The mule could be lot of things, drugged, hard to catch, bad to saddle, and have lots of other spoiled habits. What I would like to see is: the mule is in the corral, she meets you and the owner at the gate. Watch if the mule turns and faces the owner or if it turns to go the other way. Now, as he halters the mule, you want to see the mule put its nose into the halter. As he leads the mule, it's good to see the mule lead easily with slack in the lead rope, following rather than dragging. While you are brushing it, I like to see the mule stand quietly, enjoying the brushing and the conversation . Yes, conversation! Mules like it when you talk in a nice quiet voice. Yes, their vocabulary is limited to a few words they were taught in the foundation training: get over, give me the foot gee, haw whoa, etc. The best word they need to know is WHOA! Whoa means a complete stop, no other movement, just stand still and quiet and wait for you. Now he should pick up all the feet. At no time should the mule lean on you or pull away. Have the trader take a hammer and tap on each hoof. Mr. mule should stand still and quiet the whole time. All the time, watch the ears and the tail. The ears should be quiet and not stiff. The tail hangs quiet, not switching or sucked up. At this point, it’s time for saddling. You will notice that as the trader is saddling the mule, it should stand quietly. Now the bridle. As they put on the bridle, the mule's ears can be easily moved into place. If the trader has to unbuckle the bridle, the mule most likely has ear-shying problems. This can be a big problem. I have found that this is a hole (flaw) that is time consuming to fix. It can also be the start of other problems that will surface later on or when you are not expecting them. Note the bit. How does the mule respond to it? Does she neck rein or do you need to plow rein to turn? Now you are ready to watch the trader ride. I’m never impressed when some one jumps the animal out into run or a lope (canter). I want to see the mule stand still to get on, waiting to see what the rider is going to ask of him. That could be step to the right two steps or to the left five steps or a quiet back up or back at least five steps, then walk off quietly. If the mule is saddled, ask the owner to remove the saddle. Look at her back. If you see white spots, she has had an improper saddle on her. Folks try to fit a horse saddle on a mule and they hurt her back. Here is the problem with a bad fitting saddle. A mule doesn’t like pain and the wrong saddle is like boots that don’t fit. Soon with the wrong boots, your feet will get sore. There are a lot of mules that bob their heads going down a little hill. They are telling you that the saddle is hurting their back. One day they will get tired of telling you and then will buck you off when they have had enough. That way they get your attention. Other poor saddle fit symptoms are walking short and choppy, jumping around, and kicking the saddle out of your hands, to name a few. The bigger the white spots, the more severe the problems. Look for any old scars on the mule and ask questions about the scars. All the time, watch the mule's disposition. The ears need to be loose and moving around quietly. The tail should hang loose and not tight. Now have the owner lead the mule back to her corral and turn her loose. Visit with the owner and listen to the stories about the mule. Ask where he got the mule, how long he’s had her and why is he selling her. Note the mule's attitude while she is standing in the corral. Now have him bring the mule back to the hitching post and have him saddle her. If he has a britchen, note how goosey she is and the same with a crupper. If the owner doesn’t use a crupper or britchen ask why. I have seen lots of mules that when you slide the crupper under the tail or the britchen down their hips, go to kicking at you or they are very goosey. If he doesn’t have either of those items, have him tie a rope to the saddle horn , go the long way around, slide the rope under the tail and around the hips. This will show you how goosey or kicky the mule is. Now, the bit Note the bit for its ability to work with mule. When the trader gets on the mule, does the mule stand still and patiently. Ask the rider to back first. Note the ease of the back-up. Did he work off the bit or the riders legs or both? Next ask him to ride the mule in a figure. Is the rider having to pull on the rein to get the mule to turn or is the mule light on the bit? Watch to see if the mule responds to leg cues. Spend as much time as you can the first visit. Now at this time, you should tell the owner you are going to think about it. Go home and do a lot of thinking. At this point, if you’re interested in the mule, set up an appointment for a pre-purchase exam by your vet. Then, if the mule is sound, revisit and go through the steps again. You are buying this mule to relax with in your time off, so take your time. When you take your mule home, spend a lot of time on the ground with it. This will help the mule get used to you. Take him out as much as possible. Lead him around. Tie it to the mule trailer and anywhere else, so the mule doesn’t think their only job is to get fed and stand in the corral.